Perhaps someone posted a picture of you online and you want to figure out where it came from and where it’s been shared? Or maybe you found a picture you really like but want to find a larger copy? Or… Perhaps your a photographer and want to ensure no one is stealing your photos… In either case, TinEye has your back! 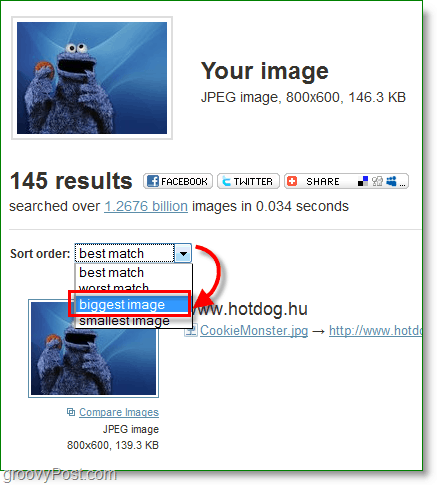 When you submit an image to be searched, TinEye creates a unique and compact digital signature or ‘fingerprint’ for it, then compares this fingerprint to every other image in our index to retrieve matches. TinEye can even find a partial fingerprint match. 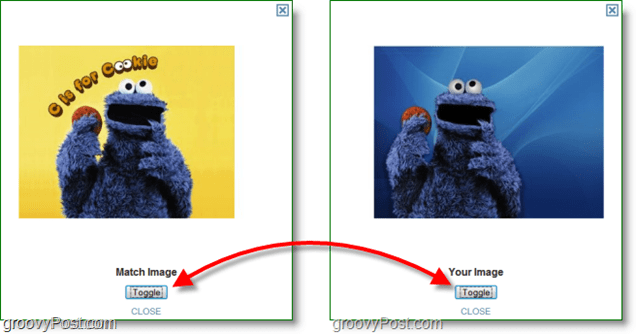 In this Step-by-Step tutorial/groovyReview, I’m going to demonstrate how to find a large version of one of your favorite images. TinEye uses facial recognition type software to identify images based solely on looks so the only thing I need is the image itself. It might sound shallow but it sure works! Let’s give it a go. 1. 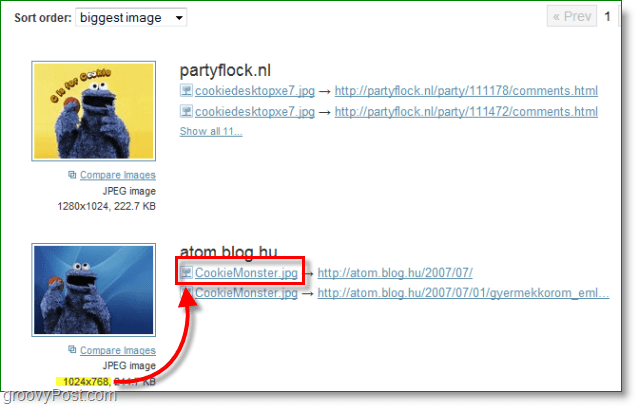 Using your Internet Browser Open http://www.tineye.com/ and either Upload your image using browse, or Paste the URL location of your image and Press Search. 2. You’ll see TinEye already scanned it’s internet database and found over 145 images which are close to or an exact match to mine. My original image is 800×600 and I want to find a bigger one. To do that I’m going to Change the Sort order to biggest image. 3. 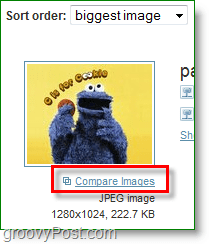 The largest image shown on the list doesn’t look exactly like my original image, but lets Click Compare Images and take a closer look at the differences. 4. The comparison window should pop-up. Click Toggle to move back and forth between your image and the matched one. You can see here the background is completely different and the cookie monster’s eyes are a little bit whiter too. 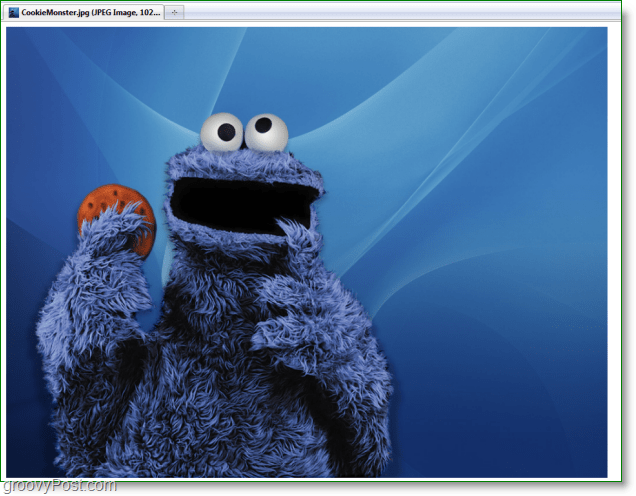 With some photo-editing skills you could take the larger cookie monster and put him onto the same blue background, but that is a lot of work so let’s look for another option. 5. The next image down is 1024×768, which means it’s a bit bigger than my original image and it’s the next biggest one available on the Internet. Click the image name to go directly to the image file online. There we go! Now we have a larger version of the same original image, and it didn’t take more than a minute to find! Let’s look at another use for TinEye. Let’s say I have a picture of someone, but I’m not sure who it is. With TinEye this isn’t a problem, as long as there are other copies of this person on the internet and their name is on the same website somewhere. For example, we have this mysterious fellow below with a very obtrusive mustache. Let’s use TinEye to figure out who this person is. 1. Upload the image to TinEye just like before. 2. Scroll down the search results until you find something that looks useful. Here I found a similar picture of what looks like a person’s name, Gemma Atkinson, in the filename. Either the mustache was a fake or this person learned how to shave. I’m going to go with the latter just to be safe. Now it’s time to put the name into Google (or Bing) and see if the search results match. It’s not always this easy though; check the next step if you can’t find a person’s name in the filename. 2.B If you can’t find a filename with the person’s name attached to it then you’ll need to browse through the website links and search through their content for the droids you are looking for. With a little bit of persistence you should be able to come across it eventually. 3. Visit your favorite search engine and Type in the Name you found attached to the image. This is to confirm and make sure we got the right name. Sure enough we found the name of the mysterious mustached lady! Now we just need to figure out the name of the mustache, but I’ll leave that for another groovy article. Questions, Comments? Leave one below or join the discussion in the groovyPost community forum.